The StreetRodder Network is proud to announce The Hot Rod Hundred, a series of regional reliability runs. 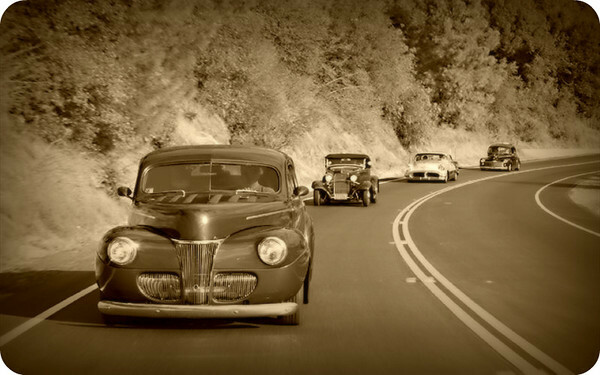 While these events will be open to “traditionally styled” hot rods and customs, which is a bit beyond the scope of The Street Rodder Network’s pre-1949 focus, we will provide photos of the 1948 and older participant vehicles. These events are in an effort to get away from the “park and sit” car shows and “cruise in” events. The organizers, of which we are part of, feel that these cars need to be DRIVEN, and we have decided to do our part to encourage that behavior. Because they are family friendly and DRIVING events, participants are highly encouraged to leave adult beverages at home. Each regional event will have a registration fee and for those who register during the pre-registration window, they will get an event t-shirt, included in the registration cost. We’ll be involved with the Southwest MO run, as well as the St Louis area run. Early registration (which gets you an event T-Shirt), will close March 1.